Judging by the comments on yesterday’s posting, it looks as if I sometimes don’t bang the drum loudly enough about what I have published. Although it was somewhat off-topic, people commenting started discussing the pronunciation of one. And some people’s perception of reality appeared to be very, shall we say, partial. To me, pronouncing "one" with STRUT is part of a cruel parody of ultra-conservative RP ("where hez wun's het gawn?"). So last night I felt obliged to point out that in my Longman Pronunciation Dictionary I made known the results of the preference poll I conducted into the pronunciation of this word. It’s in the second edition (2000) onwards. Here is the graphic from the current, third, edition (2008). 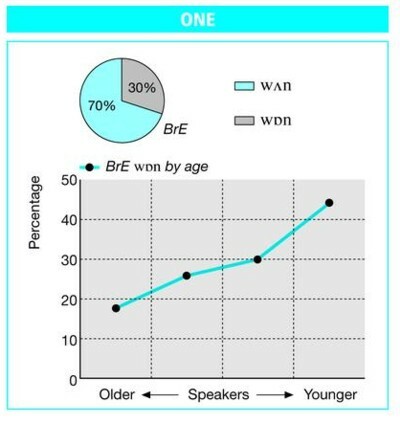 You will see that although there is a trend towards a preference for wɒn over wʌn (or for some perhaps wʊn, wən — anyhow, STRUT) in BrE, in no age group does it reach 50%. Putting it another way, for all age groups there is a majority reporting a preference for the STRUT vowel, not the LOT vowel. In my lectures about the research underlying LPD I have for many years now been reporting this finding as illustrating a gradual trend of reduced deference towards RP. The fact that more younger people than older report a preference for ɒ in one and for æ in chance can be seen as a greater willingness on the part of northern respondents to report a preference for their own pronunciation in cases where it is known to deviate from the perceived norm (RP: wʌn, tʃɑːns). Let’s hear no more nonsense about wʌn being “archaic”, “dialectal”, or “a cruel parody”. On the other hand perhaps LPD does deserve credit for being the first (I think) pronunciation dictionary to mention the existence of the variant wɒn. The Cambridge EPD has now followed, but ODP ignores it, as does the OED. As far as I am aware, so do all published general dictionaries. So you don't think young speakers throughout England are adopting the LOT vowel pronunciation of one and the TRAP vowel pronunciation of chance? Hmmm. What does the last bullet point in that slide actually mean? That the ratio of Northerners to Southerners among your respondents remained constant, or that the ratio of Ns to Ss among people reporting LOT and TRAP remained constant? Aaargh. Didn't refresh before posting. I'm essentially asking the same question as James. How may other goodies am I missing by not upgrading from the first edition? I don't think southerners are adopting the TRAP pronunciation of BATH words, except maybe in some parts of the south-west, and except for occasional cases where somebody has Northern family or has moved to the North. 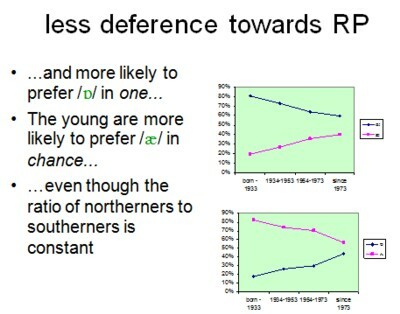 Rather, I suspect that the rate of increase in reported preferences for chance may be caused by the social profile of the respondents: younger "educated" Northerners are less likely to have adopted (this element of) RP than older ones. I'm surprised that the OED doesn't show /wɒn/; it is more inclusive than most other dictionaries when it comes to BATH words. Given that close to half of British English speakers must pronounce BATH words with TRAP, I'm not particularly impressed by dictionaries ignoring such pronunciations or seeming to label them as American. The online OED entry updated as of June 2010 shows Brit. /wʌn/, U.S /wən/ as a draft revision. The paper second edition of 1989 showed only (wʌn). James, Jarek: I meant that the proportion of northerners to southerners in each of my four age categories was more or less the same. Petyt's book, which I referenced yesterday, said that upwardly-mobile people from certain areas don't feel under pressure to switch from LOT to STRUT in words such as one, none, nothing, among, etc. That was written back in 1985, so the trend may have started around then. How old is the research that is behind that graph, and where was it conducted? And it isn't just me who is perplexed on this one: Googling around reveals an interesting discussion on Wiktionary. I do not believe that your analysis that this is merely a reporting issue over a "Northern" form is correct. That is not the environment in which my experiences of reactions to the OED pronunciation happened: this was comfortably south of those two famous vowel isoglosses. My suspicion is that this is a genuine spread of a feature in educated speech. I do not have the data to prove it, but this does not make my admittedly partial experiences "nonsense" or prejudice my hypothesis in any way. Language change does not have to emanate from Whitechapel: sometimes it can go the other way. A bit tangential, but I'm somewhat surprised that the only pronunciation given in the LPD for 'won' as in the Korean unit of currency has the LOT vowel. The pronunciation in Korean is /wʌn/ with an unrounded vowel; since there is no /w/+/o/ sequence in Korean (rounded vowels cannot follow /w/), most romanizations simply use 'wo' for the sequence /wʌ/. I use the STRUT vowel myself, so that 'won' as the unit of currency is homophonous in my speech with 'one' as well as 'won' as the past tense of 'win'. The STRUT vowel may not quite be cardinal /ʌ/ for most speakers of English, but to my ears it's still closer to the Korean /ʌ/ than any pronunciation of the LOT vowel (especially if it is merged with the PALM vowel, which sounds like /a/ to Korean ears). If you split FOOT and STRUT and use the STRUT vowel for the past tense of 'win', then in my opinion there is nothing wrong with using the same pronunciation for 'won' the unit of currency. The research, which dates from 1998, is described in detail in a paper of JW's (PDF). I think the fact that /wɒn/ marginally outscores /tʃans/ may provide some support for your contention that the former isn't just a northern pronunciation, although I'd be careful about reading too much into the numbers, given the self-selecting nature of the sample. "in Huddersfield 94% of speakers said [wɒn], in Halifax 89%, but in Bradford only 35%"
As I said yesterday, parts of East Anglia use /wɒn/ as well but there are so few people who live there that it probably didn't affect the LPD results. This is how I interpret the figures in LPD. Everyone in the North of England is aware that BBC presenters say "chance" differently from them, and this may be the subject of jokes from time to time. For whatever reason, not everyone notices the difference in other words such as "one" and it is less likely to be brought up in conversation. So, when they come to filling in an LPD questionnaire, some Northerners know that they are expected to write tʃɑːns as the correct form and do so, but they are unaware which is the preferred form for "one" as it doesn't get talked/joked about so much. I pronounce the Korean won as LOT=PALM, but STRUT in one and the native won, and I think that's conventional for current AmE. But something must have happened in 19th-century AmE: looking at the text of Huckleberry Finn, one is always spelled normatively, but the closely related once appears as once in Huck's narrative and most of the dialogue, but wunst in Jim's speech and one other speaker who has only one line and is portrayed as low-down. That could be dismissed as a spelling pronunciation, but Jim consistently says wuz whereas all other speakers (including Huck) say "was". Twain knew what he was doing, so this must reflect some kind of LOT pronunciation of these words even in regional AmE, with STRUT pretty much confined to Jim's AAVE. Jongseong: I am merely reporting my experience, which is that the Korean currency is known in BrE as wɒn. Strangely, Korean short ㅓ, despite being unrounded, sounds to English people more like LOT than like STRUT. I am aware that the use of the LOT vowel is common for Korean 'won'. What surprises me is that the pronunciation with the STRUT vowel is not even listed as an alternative pronunciation. The LPD gives the STRUT vowel in the primary American pronunciation of Pyongyang, another case where Korean /ʌ/ is spellt with an 'o'. @ Jongseong: I would've thought that Korean /a/ would be closer to the RP STRUT vowel at least. That's what I get from looking at this vowel chart anyway. I know very little about Korean though. I just know how to say happy birthday. @ Jongseong (continued): If you compare it with this, however, you'll see that RP STRUT is a bit closer. I don't know how reliable or meaningful those charts are though. I have STRUT in "one", and my accent (Milton Keynes) has never been described as archaic, dialectal, or a cruel parody of U-RP. I'm surprised by those perceptions. "10 Ns and 1 S reported LOT/CHANCE [out of 100 respondents], and in the youngest group, 40 + 4..."
I wonder whether only 100 respondents (and only 1 S) is statistically significant enough to predict trends. "The research, which dates from 1998"
So that's twelve year old research. Any plans on redoing it (preferably with a larger group of respondents)? I'd be interested to know whether the trend has continued the past decade. @Jake: There are complicated factors involved in the mapping of phonemic categories from one language to another. Koreans map the English STRUT vowel to /ʌ/ in some words but /a/ in others, although the former is the official preference and is far more common. But in the other direction, Korean learners of English consistently and virtually without exception map their /ʌ/ to the STRUT vowel, which is why you have ad-hoc romanizations like Samsung, Hyundai, Park Chung-hee, Kim Il-sung and Ji-Sung Park. 'Won' is used in the ad-hoc romanizations (as well as in more systematic ones) precisely because Koreans expect the STRUT vowel to be used and 'wun' looks strange. In North Korean pronunciation, /ʌ/ has become more rounded to [ɔ] in younger speakers, which may be a reason why Kim Il-sung's son is Kim Jong Il with an 'o' (the syllables 'sung' and 'Jong' are perfect rhymes in Korean). Interestingly, Samsung's logo, or name in corporate font, is SɅMSUNG. Very probably an attempt at free variation rather than an actual allusion to [ʌ]. Lipman, because the A without the crossbar is used with capital letters, I've never read it as ʌ but as Greek capital lambda. KIA does this as well with the A, and every time I see the logo I can't help reading it as Greek 'KIL'. Just to be clear in case anyone gets confused, the 'a' in Samsung stands for the Korean /a/; it is the 'u' in the second syllable that stands for the Korean /ʌ/. The effect is stronger because K and I don't disturb the impression of Greek. I think what must have happened in 19th-century AmE was that the strong form of "was" was already yielding to an un-de-stressed weak form wəz, whose ə is of course even less functionally distinct from ʌ than in BrE. LPD gives wʌz as the synchronically main form for AmE. I don't really see how we can conclude anything about "one" and "once", though: "wunst" is a pronunciation spelling rather than a spelling pronunciation, isn't it, for how else would you represent wʌnst in conventional spelling? At least it's obviously not of the tradition of silly spellings for perfectly normal pronunciations, simply to remind the reader that the speech is supposed to be non-standard. I think wʌnst (or wʌntst) is typical of the sort of epenthetic t we have been talking about, which then gets metathesized into full-blown phonemic status. BTW have I been hypersensitized by this debate, or are altso, eltsewhere etc. forging ahead in the media? You do give ʌ in the primary American pronunciation of Pyongyang, but you give [pʰjɔŋ jaŋ] for the Korean. And the sound file for US sounds like ˌpiɑŋ ˈjɑːŋ! Yes, that also explains "from", "of", "because" and probably other words the strong forms of which in AmE all have STRUT rather than LOT. What about 'wonder' - do any native speakers pronounce it with LOT rather than STRUT? Yes. In Birmingham (UK) "wonder" as well as "one" has LOT. I am sure that LOT in "won" (Korean currency) is merely a spelling pronunciation. Yes for the diachronic sociololinguisics of "was" that Twain seems to be indicating, I did extrapolate from "from", "of", "because" and probably other words the strong forms of which in AmE all have STRUT rather than LOT. But not just LOT, e.g. "them", which I increasingly hear with the strong form ðʌm in AmE, and perhaps significantly although LPD gives only "ðem, weak form ðəm" for both UK and US, the sound file for US is ðəm. On the other hand not only does this not happen with the conjunction "that", but it seems increasingly to have no weak form to un-de-stress. Young people in particular increasingly seem to have only the strong form "that" for the conjunction, in BrE as well as AmE, though this strikes me as AmE in origin. For some Southerners, "was" seems to be pronounced with what I think is a THOUGHT vowel, not LOT. That's a hard distinction for me to make, since I merge the two, but I believe this is the correct interpretation. The woman who taught me this was from Tennessee, but I do not know how widespread it is. She also pronounced "because" and "want" similarly. "wunst" is also spelled "oncet," and, either way, the ending t is dialectal. When I recently reread Huck Finn, my thought was that he was not speaking an accent that I have ever heard personally. I'm not sure it's southern at all, but perhaps archaic midwestern. Thank you Julie. I thought THOUGHT was possible in all three, but only "because" and "want" have that possibility in LPD. There's a Pronunciation Preference Poll for "because", which gives 57% for STRUT, but doesn't attempt to break up the percentages for THOUGHT and LOT, which is indeed a hard distinction for most of us to make in AmE. My husband grew up less than 200 miles away from me in California and naturally distinguishes THOUGHT and LOT with sounds I can tell apart only with effort (and sometimes a bit of lip-reading). He sometimes pronounces "want" with one of those sounds; I'm not sure which. But the accent of the speaker I mentioned really caught my attention at the time, and her LOT and THOUGHT were not that similar. "Was," "because" and "want" are all definitely STRUT for me, as are "from" and "of." Reduced "them" is rarely ðəm, usually əm. From literature I would have guessed that to be normal in many accents.